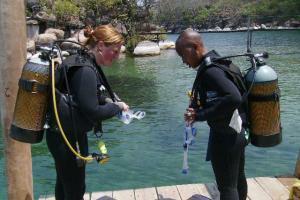 Some of the best SCUBA diving in Lake Malawi! Previously known as Frogman Divers, Cape Maclear SCUBA began operating as a dive school in Cape Maclear, Lake Malawi National Park in 1996. We operate from premises next to famous landmark, Mr Steven�s Rest House. 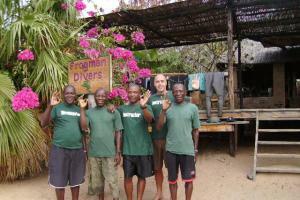 The team consists of instructors Rob Assad and Patrick Phiri, dive master Louis Chitsulo, and boatmen, Sign and Watson. We dive out of Cape Maclear using traditional wooden boats with 15 HP engines and all the dive sites are within a twenty-minute, pleasant boat ride from the lakeside school. Cape Maclear SCUBA offer all PADI courses from Discover Scuba to Dive Master. Classes are small and personal so you get all the guidance and attention you need. The school uses T-ONE Scuba Pro BCD�s and new Scuba Pro 5mm wetsuits, so no diver at Frogman�s should ever get cold. Cylinders are filled by a Bauer electric compressor so the fresh, filtered air is always clean. Safety and fun are the dive team�s focus and their track record of zero dive accidents is strong proof of this. Your safety and enjoyment are the team�s number one concern. Robert C Assad #180887 joined Kayak Africa in 2002 and has been instructing and managing the dive school ever since. With our 500 Padi certifications as well as being an Emergency First Response Instructor, your safety and diving experience are in good hands. Patrick Phiri has been working as a dive master for the last five years and qualified as the first Malawian dive Instructor in 2008. He has done over 1 500 dives in the lake and has a superb knowledge of the local marine life and environment.